After braving the somewhat wacky wearables area in the Sands at this year’s Consumer Electronics show — unfashionable brainwave helmets are a “thing” this year — it became clear that most of the products are rehashes of fitness and health trackers. Everybody, it seems, has their own wrist-based device to measure sleep, steps and such. Among the more unique products were the smart socks from Sensoria Fitness. Granted, these aren’t quite new: The company raised more than $115,000 in a successful 2013 Indiegogo campaign. I haven’t had the chance to see them myself, however, so I got a closer look on Wednesday. 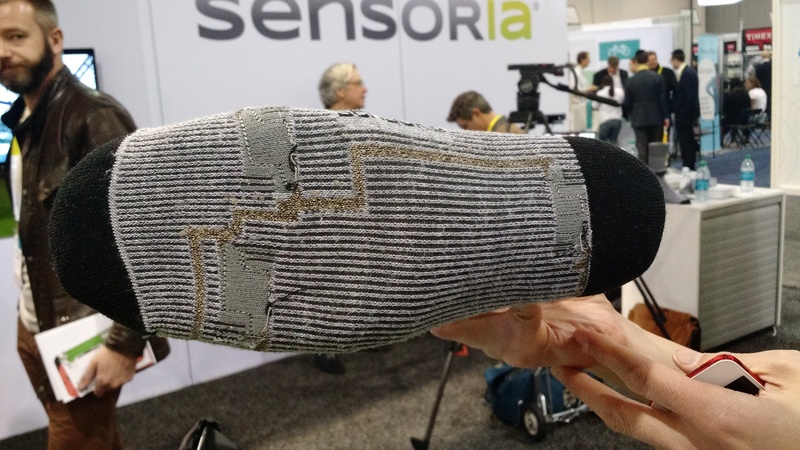 Much like the OMSignal vest I recently tested, the Sensoria socks are constructed with conductive fibers. If you handed these socks to someone, I’d be surprised if they knew they were “smart socks,” which is a good thing. Sensors on the bottom of the socks measure your foot-strike and cadence, sending the data through fibers to a magnetic cuff that attaches to the top of the socks. The cuff houses a Bluetooth radio to get the data to a companion app currently available for [company]Apple[/company] iOS and in preview for [company]Google[/company] Android devices. The Sensoria folks tell me they’re also working on a [company]Microsoft[/company] Windows Phone app. The Sensoria app can, for example, plan your running cadence for a workout and it will tell you if you’re not meeting that goal, or if you’re running with a faster cadence than planned. 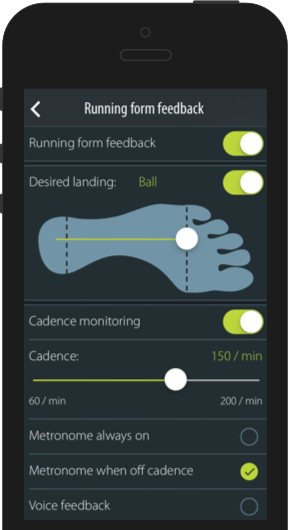 Additionally, the app will alert if you if you’re landing on the heel of your foot, which can lead to injury. I asked about any additional data that could be gathered by the socks when I’m running; in particular, I’d love to get the strike angle of my foot as it hits the ground. Sensoria says it’s possible and something they’re looking into in the future. For now, you get the basics to help run more efficiently in a device that looks like, and can be washed just like, a pair of socks. At a time when it appears everyone who can stuff sensors into a plastic gadget for your wrist, it’s nice to see some companies using innovative textile technology for wearable devices that look like what you wear today. Yes, the sensor-filled bracelets, watches and bands have their place, but I’m more excited about the future of smart fabrics in everyday-looking clothes. So too is Davide Vigano, the co-founder and CEO of Sensoria, who spoke about this topic in October at our Gigaom Structure Show. Update: This post was updated on 1/8/2015 to correct an error that stated landing on the ball of your feet leads to injuries. It is quite simple guys, the faster you run the higher the heel is raised off the ground. When the foot lands, there is NO heel contact. Just YouTube Usain Bolt 100m sprint slow motion for reference. Secondly the slower you run aka marathon runners, the heel lowers and there is heel contact BUT the ball of your foot is still the primary player here. A heel to ball type style is inefficient and leads to all sorts of injuries. What powers these socks? How does the Bluetooth radio gets its juice? The cuff has a Bluetooth radio with battery inside. Other way around. Heel strike is bad as it prevents your achilies/calf/etc to absorb the shock and instead puts the shock all on your knee. Actually, newer research shows there is little difference in injury rates between ball and heel strikers. Runners should do whatever feels most comfortable. No offence Mike, not a chance that research can be correct. Heel strike leads to a host of anatomical problems. Overuse of wrong muscle groups. Yup, I completely and inadvertently reversed that. Fixing and thanks! Washed in a washing machine and dried in drier? Washedbin a washing machine for sure. I’d probably air dry them or use low heat.